Pasta comes in many different form and shapes. 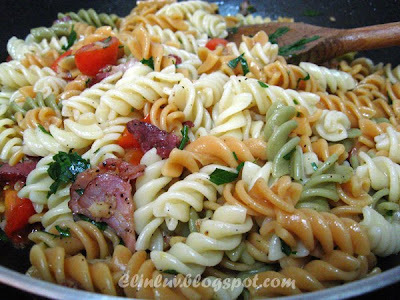 Dried pasta are easily valiable in the market while the fresh ones are only available in restaurants . They are made from durum wheat flour , water, salt and sometimes egg. Some shapes are especially suited to a particular sauce. They are so versatile, you can pair them off with different sauces and they will still blend well :)) Some basic sauces for pasta are listed below. For me, I love the tomato and olive sauce and garlic sauce with parsley . I would normally use fresh tomato, garlic, fresh italian parsley and ground black pepper for my pasta. 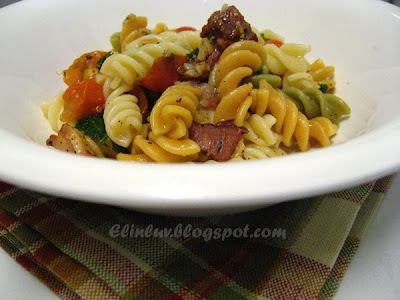 For additional flavor I add in some streaky bacons and mmmmm.. the burst of flavor is so very good that it has always been the favourite ingredients in my preparation of this dish. Infact it is so versatile that you can add in any ingredients you like. I use them in my salad too :) The next thing I would want to try out is to make my own fresh pasta...lol my wish before the year ends :)) But for the time being, dried pasta will do , for now tricolore fusilli made from durum wheat semolina , tomato powder and spinach powder is healthy enough for us :) and I cooked them the fast and simple way... Aglio e Olio is a traditonal italian pasta dish that can be made cheaply without seasonal or store-bought ingredients, said to originate tradionally from the region of Abruzzo, usually served with spaghetti. The sauce is made by lightly sauteeing minced or pressed garlic in olive oil , sometimes with the additon of dried red chilli flakes. Finely chopped parsley can be added as a garnish. 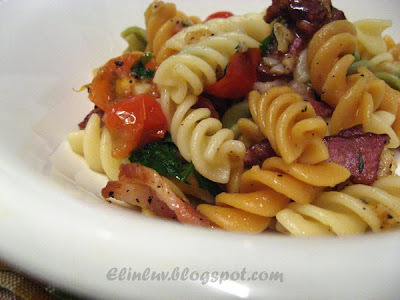 For me, I would add in fresh tomatos and instead of chilli flakes , I substitute with ground black pepper....what a delicious fast and easy to make pasta dish. You can whip this up in less than 25 minutes ! he gets more meat protein to help out his muscles building workout. very colourful...too colourful to eat. 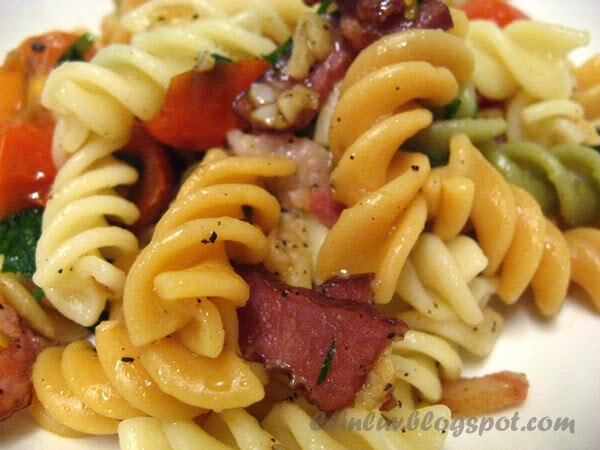 Yummy I love Fusilli pasta, and your recipe is perfect. Light and tasty! Joanna is going to have an amazing feast the food is even better than you could imagine. Elin, the bacon sounds so seducing! Have to pick up some bacons on my next shopping trip. Hopefully, will not fogetting it AGAIN & again! haha.... 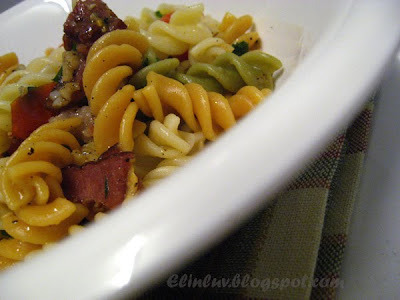 This is wonderful & comfortig pasta dish. May be I cooked it in the wrong way. Hey, your pasta looks so delicious! Streaky bacon really boost up the whole dish. 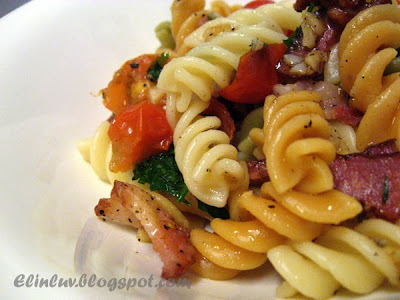 I love using streaky bacon for pasta too! Oooo...lovely. And bacon! To die for... I love bacon - but too expensive. Sobs!!! Yum, a simple aglio olio pasta is one of my favourite dishes from childhood. Growing up,we often had it on a Friday night when meat was not allowed. I loved it with plenty of grated pecorino cheese on it. Simple and delicious pasta dish! 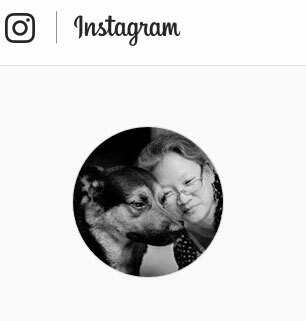 I love it, Elin!